Imphal, May 09 2018: Barely 20 hours after twin blasts at IGAR (South) PRO office (Sanjeevani) gate, near Hotel Imphal in North AOC which injured an Assam Rifles Jawan, another IED explosion at the gate of BSF camp at Koirengei kills two BSF personnel today afternoon. Three civilians including 2 women also sustain serious injury. Report reaching here said that the IED blasts occurred at around 1.30 pm today afternoon inside a variety store owned by one Ichan Meitei. The variety store is located on the roadside of Imphal Dimapur road, at Koirengei at the south eastern corner of the BSF SHQ campus. Beside, destroying the variety store 4 persons including a woman and 2 BSF constables who were on RP duty sustain serious injury. One of the BSF personnel was severely hit by the splinter of the blast below his knees that it almost amputated on the spot. They were immediately rushed to RIMS Hospital but succumbed to injury. The deceased BSF personnel have been identified as NN Meetei constable No.10633129 and constable No 120905384 Sanjay Tirkey. 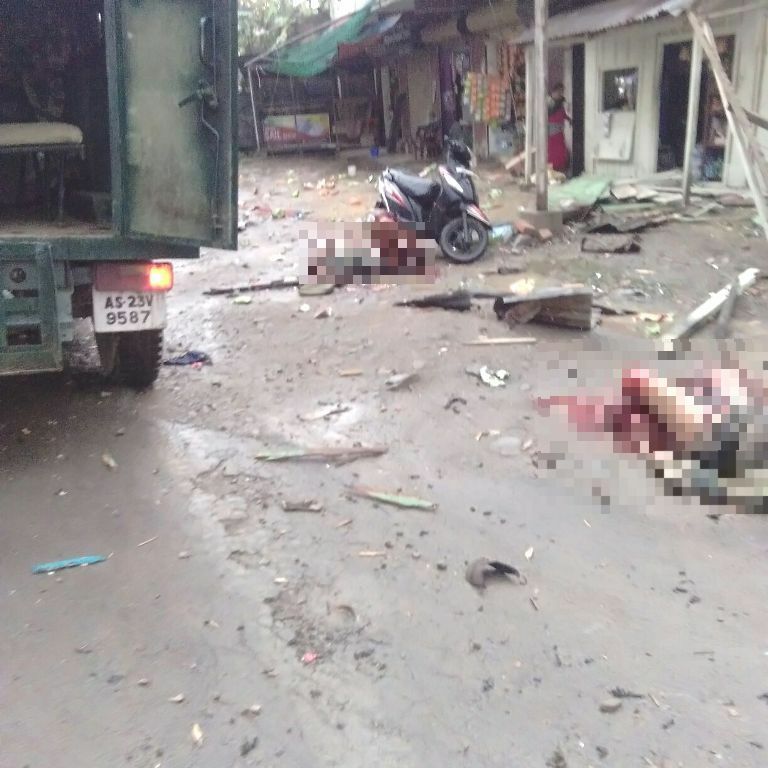 The 3 injured have been identified as Mangshatabam Premlata Devi 40 years, D/O M Ningthemjao of Luwangsangbam Makha Lekai; Heishnam Mubi, Heishnam Manglem of Maiba Khul, Van driver of Public School and Bindya Thakuri 19 years, D/O Tilak Bahadur of Koirengei BSF Gate. Bindya sustain minor injury however the other two are undergoing treatment at Raj Medicity . Condition of the lady is stated to be critical. Mention may be made that 2 simultaneous blasts occured at the IGAR (South) PRO office (Sanjeevani) gate, near Hotel Imphal, North AOC injured one Assam Rifles Jawan yesterday evening at around 6.30 pm. The first bomb blast occurred at the front of the PRO office gate, while the other at the northern side of the gate near the wall. The injured Jawan was identified as N.Prem Singh of 22 AR, Tamenglong, presently attached with IGAR (S) liaison cell PRO. He is a resident of Kakching.